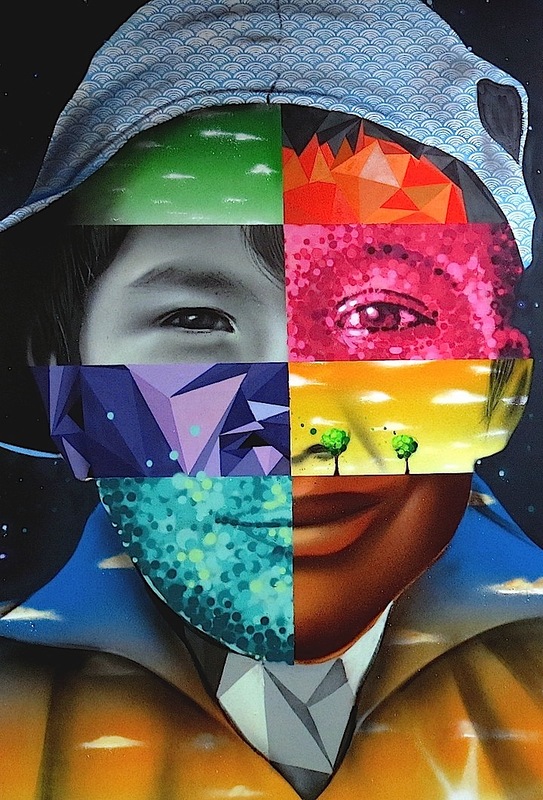 Chilean artist Dasic Fernández has been captivating us with his sumptuous styles since we first met him up in the Bronx, while painting a bus in collaboration with Cekis. 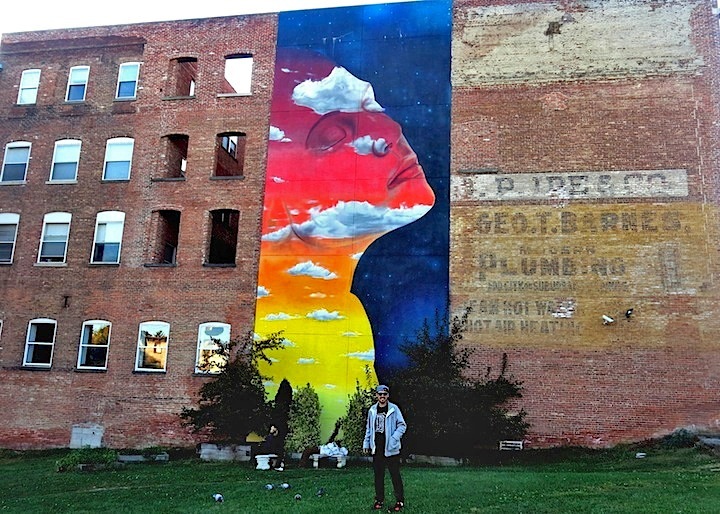 We recently caught up with him in Newburgh, New York, where he’d been busy at work transforming the city’s visual landscape. I was 13 when I started tagging in Rancagua, Chile. The hip-hop scene! Graffiti was part of the movement. And I knew how to draw – so that was my way into it. Have you any early graffiti memories? Nothing specific! Just hanging out late with my best friend and bombing. What percentage of the time is devoted to your art? One hundred percent! If I’m not doing it, I’m thinking about it or dreaming about it. Everything I’ve learned about painting on the streets and appropriating space I learned from graffiti. 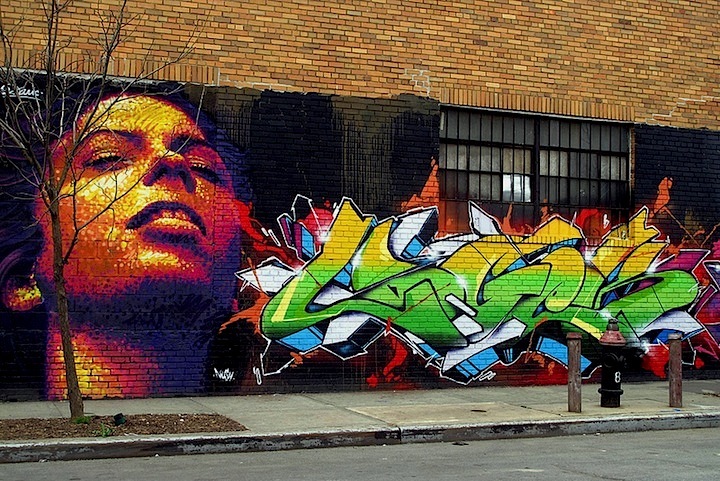 I never felt any tension between street artists and graffiti writers. I still use the same fat cap to paint as did to tag. How do you feel about the movement of graffiti and street art into the galleries? I respect it only when artists have had long courses in the streets first and continue painting in the streets once they’ve shown their work in galleries. Have you exhibited in a gallery? I had my first solo exhibit in Santiago, Chile in 2009. I’d rather work by myself. I feel more comfortable, and I can take my time. How do you feel about the role of the Internet in all of this? I don’t use it much. I feel like graffiti belongs on the streets. At first, I didn’t even photograph any of my works. But when a graffiti book came out that didn’t include any of my work, I decided that I had to. I studied architecture back in Chile, but I quit less than a year before earning my degree. The streets. That’s where I feel most comfortable. It is my natural environment. I love connecting with people while I’m painting outside. It makes me happy. 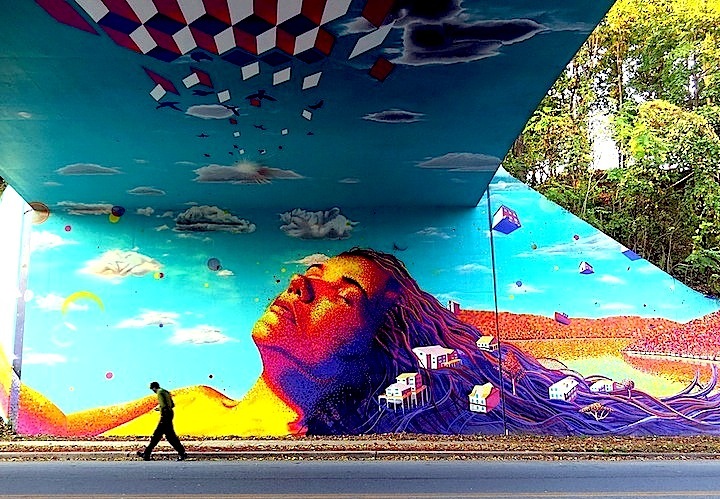 The mural culture in South America and Chile’s political murals, which are poetic and graphic. And I have also been influenced by hip-hop culture. Do you work with sketch-in-hand or do you just let it flow? Never! Sometimes I’m close to being satisfied, but I’m never completely satisfied. I’m far too critical. How have your work evolved throughout the years? I paint on a bigger scale and I use more colors. They used to bother me, but now they don’t. I still don’t like, though, when they upload photos of unfinished pieces. 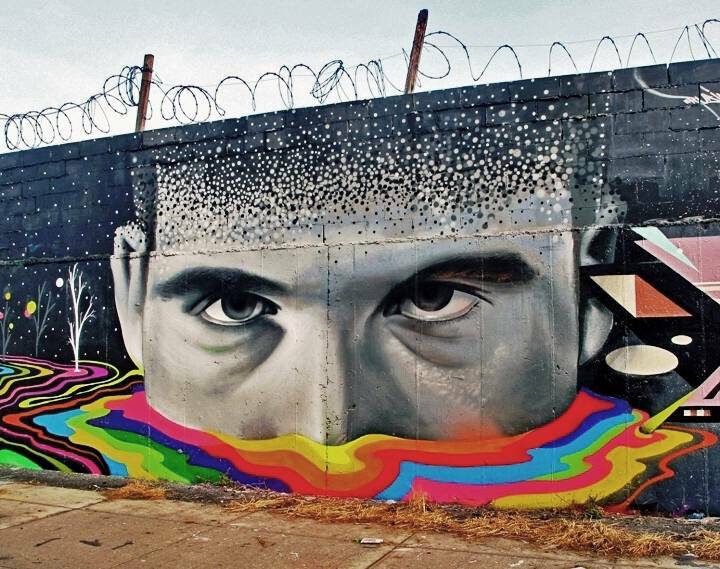 Why do you suppose the art world has been so reluctant to embrace street art and graffiti? Because it’s the most powerful graphic movement out there. I’ve painted throughout Chile and in Argentina, Uruguay, Brazil, Peru and in Canada. And in the US, I’ve painted in Chicago, Texas, Michigan, and New York. Have you any preferred spots or surfaces? 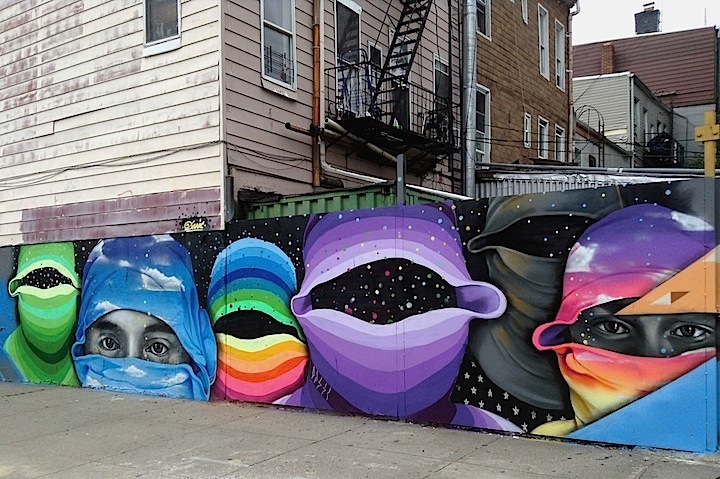 I like when a wall has context to spare, so that it can assume an identity through a mural. Many personal projects with different timelines. I’m working now on completing a series of commissioned walls and canvases. I’m then planning to return to Chile and work on a book featuring my artwork. Then – more walls and an art festival that I’m organizing in New York and probably a solo exhibit. Basically I’ll keep flowing, painting and traveling. And there’s more! Interview by Lois Stavsky with Tara Murray; photos 1. with Okuda and Rubin in Bushwick by Lois Stavsky; 2. in Bushwick by Tara Murray; 3. with Rubin in the Bronx by Tara Murray; 4. in Newburgh school by Lois Stavsky; 5 & 6. in Newburgh, NY by Lois Stavsky 7. with Logek in the Bronx by Tara Murray.